Deciding how large a family vegetable garden will be means you need to take a few things in to consideration. How many members you have in your family, how much your family likes the vegetables you eat and how well you can store the excess vegetable crops can all influence the size of a family vegetable garden. But, you can make an estimate on what size garden will feed a family so that you can try to plant enough to enjoy all of your favorite vegetables all season long. Let’s look at the what size garden will feed a family. The most important thing to consider when deciding how big your family garden should be is how many people in your family you need to feed. Adults and teens will, of course, eat more vegetables from the garden than children, infants and toddlers. If you know the number of people you need to feed in your family, you’ll have a starting point for how much of any vegetable you need to plant in your family vegetable garden. The next thing to decide when creating a family vegetable garden is what vegetables you will grow. For more common vegetables, like tomatoes or carrots, you may want to grow larger amounts, but if you are introducing your family to a less common vegetable, like kohlrabi or bok choy, you may want to grow less until your family becomes accustomed to it. 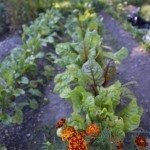 Also, when considering what size garden will feed a family, you also need to consider if you will be planning to serve only fresh vegetables or if you will be setting preserving some to last through fall and winter.